SHANGHAI -- China will soon begin its grand experiment to rein in climate change, using the nation's regionwide carbon markets as the building blocks for what could become the world's second-largest emissions trading market. Four out of seven Chinese pilot regions -- Shanghai, Guangdong, Tianjin and Hubei -- have issued their versions of cap-and-trade plans for greenhouse gas emissions. While Beijing and Shenzhen have yet to unveil their final plans, major parts of them were drafted and discussed in news conferences last year. Chongqing has been the slowest mover in developing its carbon market, but it will still be able to start trading by the end of this year, local media have reported. 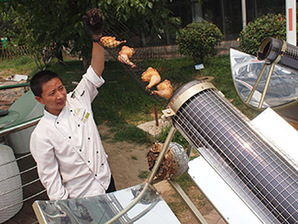 A chef in China's Shandong province removes chicken from a solar cooker. Backers of emissions trading say the spread of solar use in China will accelerate once traders begin buying and selling offsets. Photo by Tom O'Malley, courtesy of Flickr. China's emerging regional carbon markets are designed to accommodate local characteristics. For instance, Guangdong, a manufacturing hub, only charges factories for carbon dioxide they emit, while Shanghai's system charges airports, office buildings and others. But they follow the same criteria in many other aspects. For one, seven pilot regions all set an overall ceiling on carbon emissions based on their carbon intensity goals. China has pledged a 17 percent cut in its emissions per unit of economic output by 2015, compared with 2010 levels, and has assigned emissions reduction targets to each region. The pilot regions have translated that target to specific quotas that limit what individual polluters can emit. Polluters that emit beyond these limits are required to buy more carbon allowances; those that become more efficient can sell leftover allowances. Polluters can also secure offset credits, known as Chinese Certified Emission Reductions (CCERs), by financing projects that remove carbon dioxide from the atmosphere. This is expected to boost China's renewable energy capacity because financing from polluters can support more wind farms, hydroelectric dams and solar power plants. The ambitious goal of those Chinese regionwide carbon trading pilots is to prove that the mechanisms work and can be deployed on a larger scale. But for now, there is still a long list of missing elements in those regional schemes. Except Shenzhen, none of the Chinese pilot regions have clarified under which legal framework their cap-and-trade schemes will be enforced. It is also unclear what penalties, if any, will be imposed when polluters exceed their emissions caps but refuse to pay the fee. Another unknown is how the Chinese government will influence carbon trading in order to avoid prices swinging wildly. Those missing elements are expected to come out soon, as China is set to start its regional carbon trading this year. Many believe the timeline will not be delayed due to strong international pressure on China to reduce emissions and a strong domestic desire to seek market forces against global warming. Already, Shenzhen reportedly said it will begin trading June 17, the first announced start date. It isn't officially announced whether nonpolluters can trade allowances on the Chinese carbon market, but they will certainly be allowed to take part as offset credit suppliers. And they want to do so. GreenStream Network PLC, a Finnish firm that develops and manages carbon assets, recently signed contracts to buy 1.2 million tons of annual offset credits generated by eight renewable energy projects in China. The company plans to increase that volume tenfold by the end of this year, said Karl Upston-Hooper, Greenstream's general counsel. "Carbon prices in China might not be attractive in coming years, but we see this as a step to strengthen our position and get ready for the emerging Chinese carbon market," Upston-Hooper added. According to a report published last year by the Climate Institute, a Sydney-based nongovernment think tank, China will become the second largest carbon market in the world in terms of regulated emissions, covering 700 million tons of emissions by 2014. By contrast, the report notes, figures for the carbon markets in California, Australia and the European Union will be 165 million tons, 382 million tons and 2.1 billion tons, respectively. But China's huge carbon market potential may not immediately lead to big money flows. That's because polluters under the system will obtain most of their needed allowances for free in coming years. This helps smooth their transition to carbon trading but hampers the market demand. Additionally, futures and other financial products will not be traded in the Chinese carbon markets at the current stage. The decision to restrict the involvement of the financial sector has sparked debates among carbon trading professionals. Supporters view it as an essential safeguard to control risks, while opponents argue that prohibiting financial products from the Chinese carbon market will lower trading activities, making the trial run a useless exercise. On top of that, there is concern over whether China's carbon trading pilot regions are prepared. One key problem that experts are wrestling with is the absence of accurate records on what polluters have emitted -- crucial information for deciding emissions caps. Chinese authorities have recorded energy consumption of polluters for years and used it to estimate emissions, but different institutes often come up with different results, due to a lack of unified methods, said Chen Hongbo, associate professor at the Chinese Academy of Social Sciences, a key government think tank in Beijing. "So even if some emissions data are available, we can't rely on it," Chen added. The Chinese government launched a program in 2010 to regulate how to measure and calculate greenhouse gas emissions. Chen says this ended the mess but didn't end the work of getting individual polluters' emissions data right. More work is also needed in consulting with polluters under the system, according to Alvin Lin, climate and energy policy director for China at the Natural Resources Defense Council, an environmental organization based in New York. As polluters are major participants, Lin worries that lacking their input in the market buildup will affect the success of carbon trading. "As environmentalists, we are happy to see that China's carbon trading progresses quickly," Lin said. "But if China starts carbon trading without adequate preparation, there could be problems, and that could hurt the public's confidence on this new mechanism." But figuring out the right time to start carbon trading remains tricky, said Jeff Swartz, international policy director at the International Emissions Trading Association, a nonprofit industry group headquartered in Switzerland. "This is a bit of a chicken-and-egg situation," Swartz said. "Do we start trading even if we are not exactly ready, or do we wait until we get everything ready? I think we have to take risks because the more experience we have, the more learning process there is, the better market design will be later on." Cap and trade entered China's political agenda in 2009, when the government here promised a 40 to 45 percent cut in its emissions per unit of economic output by 2020 against 2005 levels. At that time, Beijing viewed it as the best option among all the emissions reduction measures, including carbon taxes, recalled Lu Xuedu, a former Chinese official and an adviser at the Asian Development Bank. That's because cap and trade fits emerging economies better, Lu said. Unlike Europe, China is still in the middle of industrialization, and that requires space for further emissions. Lu says Chinese policymakers believe it is relatively easier to balance development concern and emissions cuts through a trading system than a tax-based system. Besides that, industries here have faced tougher competition in export markets because of a growing production cost and a stronger Chinese currency. Putting a price on carbon will increase the difficulty. Compared with carbon taxes, Lu said, cap and trade is more likely to be accepted by Chinese industries because it provides more options to meet their obligations. The industries can generate cash by selling unused carbon allowances for profit if they reduce emissions more than required. Meanwhile, Chinese leaders hope that one day China's carbon market will tie into existing markets in Europe and elsewhere, giving the nation a bigger say in global matters. A carbon tax policy can only be implemented in China, so it can't provide that benefit. Yet Chinese leaders have recognized that they will need more practice at home before joining the international pact. The country's regional carbon trading plans call for market integration among the seven pilots by 2015. There is also a call to help more polluters get familiar with carbon trading. While still not included in the upcoming system, hundreds of facilities in Guangdong and Shanghai are being required to monitor and report their emissions, a move designed to prepare them for serious trading. At first, only carbon dioxide will be covered in China's cap-and-trade systems. But over time, the types of greenhouse gases regulated by the Chinese pilot regions will increase, widening the scope of the nation's emissions reduction.